May 2017 – Welcome to Wyandotte Daily! 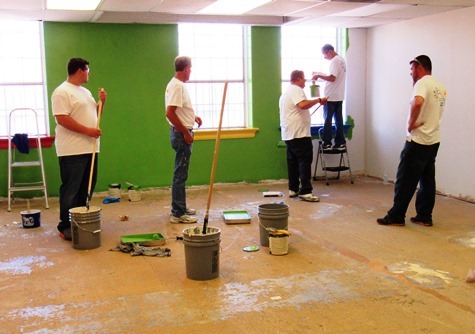 More than 30 PPG employees converged on the State Street youth center today to add a fresh coat of paint. 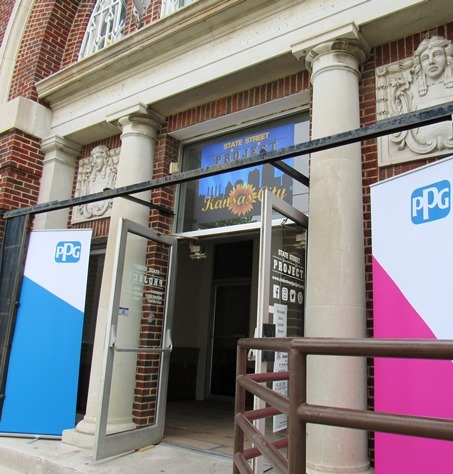 They also left a $20,000 check for a 10-week summer program and camp in science, technology, engineering, and math for about 100 youth at the youth empowerment center at 1017 N. 9th St., Kansas City, Kansas, as part of the PPG Colorful Communities initiative. 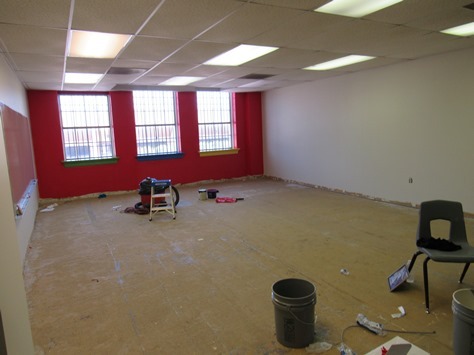 The center selected bright and vibrant colors for the painting project, giving the center a new energy. About 15 youth were at the center today participating in the check presentation ceremony. 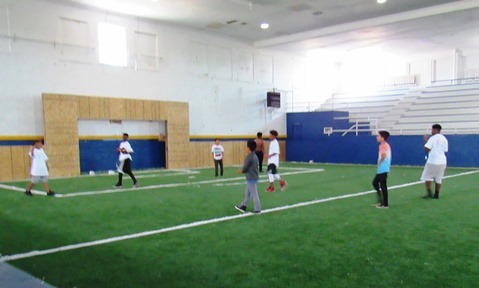 They also were involved in a soccer game in the gym in the building. 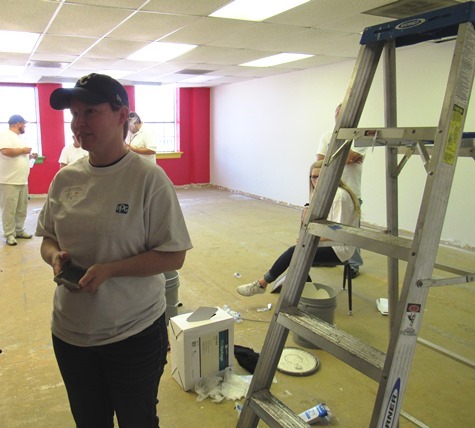 Tawnya Metzler-Martinez, co-founder of the State Street Project, said the youth make many of the decisions at the center, and many of the programs are created by youth. The goal is for the youth to find a positive place where they can grow into healthy adults, she said. The focus of the programs fall into five categories, she said, including housing, hunger, health, education and economic development. The State Street Project started in an apartment about eight years ago, and “we never thought we would have a building like this,” Metzler-Martinez said. Leslie Johnson of PPG first recognized that State Street could use a colorful coat of paint, according to Thomas Maziarz, PPG vice president. Those attending today’s check presentation event included Unified Government Commissioner Brian McKiernan; Chuck Schlittler, director of the Downtown Shareholders; and Sandra Olivas with the Bank of Labor. 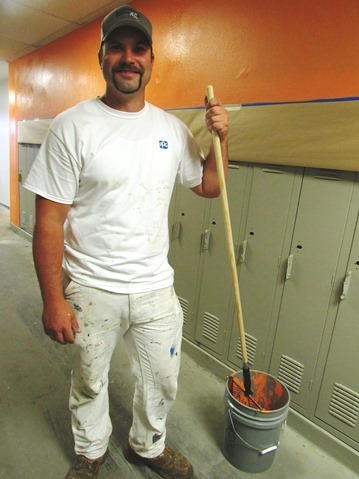 Besides 30 PPG volunteers at the center today, a painting contractor, Ryan Toelkes of Neighborhood Painting in Piper, was working on the project with two associates. 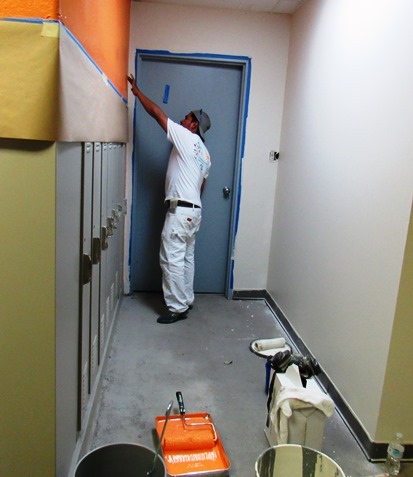 Toelkes got all the lockers ready and did the prep work for the project. Many years ago the building housed the Kansas City, Kansas, High School, Toelkes said. 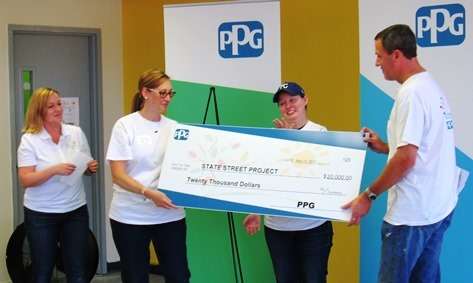 PPG launched a worldwide initiative donating $10 million during 10 years to communities in which they operate, and this is one of the projects in its Colorful Communities initiative, according to a spokesman. Wyandotte County residents who use tobacco products will be eligible for free medications to help them quit. The free medications will be available from May 31 to June 30 while supplies last. Free nicotine replacement therapy (NRT) will be available to the county’s residents who call the Kansas Tobacco Quitline, 1-800-QUIT-NOW (784-8669). To receive the medications, callers must enroll in the Quitline program with a trained coach and must be medically eligible to receive the free medication. The medications include nicotine lozenges, gum, and patches. Smoking is still the leading cause of preventable death and disease in Kansas. But it is an even greater health threat in Wyandotte County, where the smoking rate is higher than national and state averages. Nearly 24 percent of the county’s adults smoke, compared to a state average of just under 18 percent. These smokers, and the non-smoking loved ones who live with them, are at greater risk of heart disease, asthma, cancer, stroke, and other diseases. More than half of Wyandotte County adults who smoke tried to quit at least once in the last year. Garza said that smokers are more likely to have success quitting if they combine the use of medications with counseling available through services like the Quitline. Medication isn’t the only way someone can quit as smaller things are also shown to work. Methods like chewing gum and regular exercise through fun, easy things like tennis lessons work well too. Every person has their own triggers and their own ways of coping with cravings so it is very much up to the individual. The Kansas Department of Health and Environment, which operates the Kansas Quitline (1-800-784-8669), is providing the free medication to Wyandotte County residents while supplies last. Go to http://www.hcwyco.org/freenrt for more information. After 10 hours of debate, a dozen amendments and a timeout to talk taxes, the Kansas Senate early Wednesday advanced a school finance plan and returned later in the morning to approve it on a 23-16 vote. Once they finished the late-night debate, senators ended where they began: an additional $234 million over two years for K-12 education. That is $50 million less than the House plan that the Kansas State Department of Education now says would add $284 million in new money over two years and then increase funding according to the rate of inflation. But some senators who voted for the plan, like their House colleagues, believe neither bill has enough funding to satisfy the Kansas Supreme Court, which ruled earlier this year that the current amount is inadequate. Even Majority Leader Jim Denning, an Overland Park Republican who carried the bill, is prepared for an adverse ruling from the high court. “We’ll come back for a special session and sort it out,” he said during a GOP caucus before the debate. While the funding formula is similar in both bills, the Senate bill includes an amendment that would phase out some of the money the state pays for out-of-state students to attend Kansas schools. The Kansas State Department of Education says about 625 students cross the state line into Kansas for school. That costs up to $6 million a year. The amendment would not ban out-of-state students but would cut state aid for them to 75 percent next year and 50 percent after that. During debate, Senate Democratic Leader Anthony Hensley of Topeka attempted to add $419 million to the plan. “I think that both the House and Senate bills are inadequate,” he said. His amendment failed on a 16-23 vote. Sen. Rob Olson, an Olathe Republican, proposed an amendment to remove funding for all-day kindergarten. He said that would save $63 million a year. Senators also rejected that amendment. The two bills now move to a conference committee to negotiate differences, but most lawmakers expect that to be a smooth process.